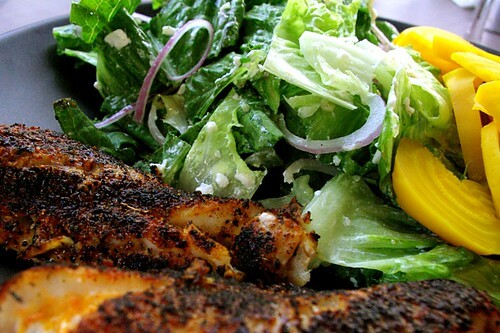 blackened local perch with goat cheese and golden beet salad dressed with garlic vinaigrette, originally uploaded by aarn! +11th May, 2009+. rubbed the fleshy side of some perch fillets in a blackening seasoning consisting of the following spices ground together: 1t. sweet spanish paprika, 1t. black pepper, 1t. salt, 1/2t. cayenne, 1/2t. dried garlic flakes, 1/2t. dried onion flakes, 1/2t. dried oregano, 1/2t. white pepper, 1/2t. dried thyme, 1/2t. dried mace, and 1 small tobasco pepper. drizzled 1T. of clarified butter over the coated, fleshy sides of the fillets (probably should have patted the fillets dry, then brushed with clarified butter and then dipped...next time). let a clean and dry skillet sit on a 14,000-btu flame for about 10 minutes until white hot and smoking. placed the fillets in the hot pan, seasoned side down, making sure to drop away from the body (this pan was seriously hot), and let cook until nicely colored throughout, probably about 1-2 minutes, then flipped the fillets to the skin side, spooned another 1T. of clarified butter over the top, and put the skillet into a 350-degree oven for 6 minutes (the tension on the skin side of the fillets made the fish curl up a bit, but the skin was delicious and held the fish together under such great heat). tossed some chopped up romaine lettuce in a vinaigrette of 1T. lemon juice, 1 clove of crushed garlic, 1t. brown mustard, salt, and pepper, slowly emulsified with vegetable oil to taste and viscosity. served with some boiled, peeled, and sliced golden beets and crumbled fresh goat cheese.